Frame and display your race photos, finisher medals and race bibs just like a professional in minutes with our ready-made framing kits and photo medal hangers. High-quality materials that will preserve your memories for a lifetime. Easy to follow instructions. 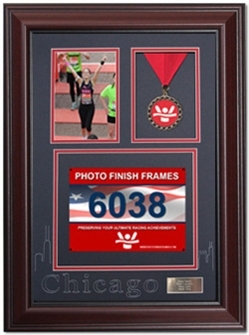 Included diamond engraved brass or silver race informational placard with all framing kits. Combine multiple frames and medal hangers to create the ultimate race gallery. Makes a great gift. 100% Satisfaction Guarantee. Now you can capture your moment of victory and display your 5 x 7" race photo, finishing medal, racing bib and race information in our custom hand-crafted Victory & Triumph Endurance Framing Kits. 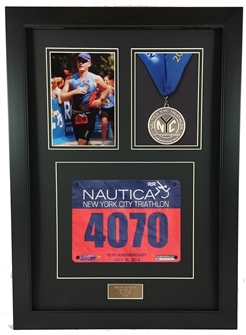 Our framing kits includes everything you need to display your moment of glory just like a professional in minutes. No tools are required. 100% Satisfaction Guarantee. Our frame was designed with a European influence that is perfect for the classic at-home, comfortable feel. The wide profile frame draws your attention to the photo and finishing medal inside the frame and blends smoothly into most interior design styles. The Victory & Triumph Endurance Frame looks great in any home or office.